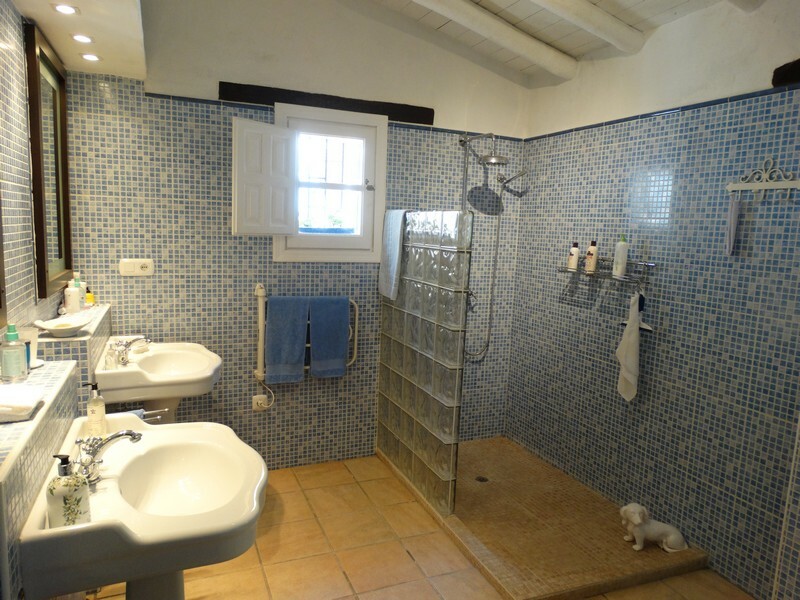 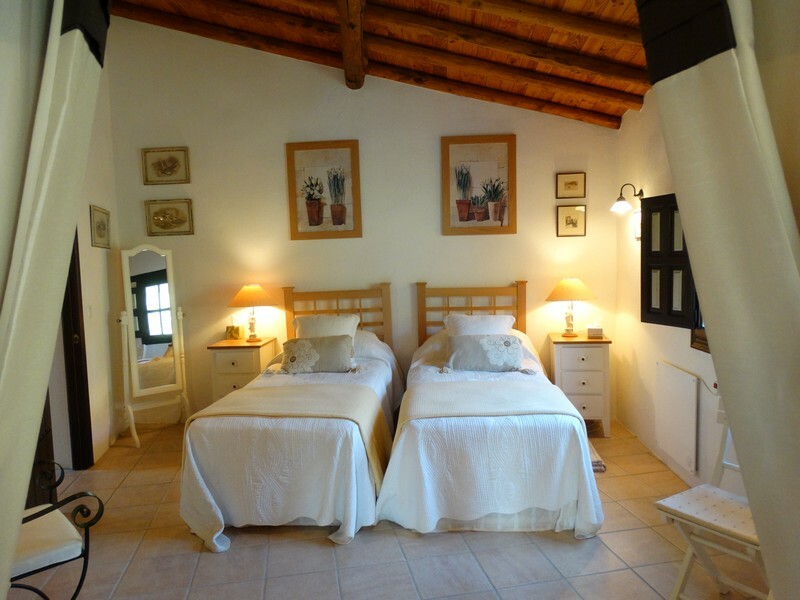 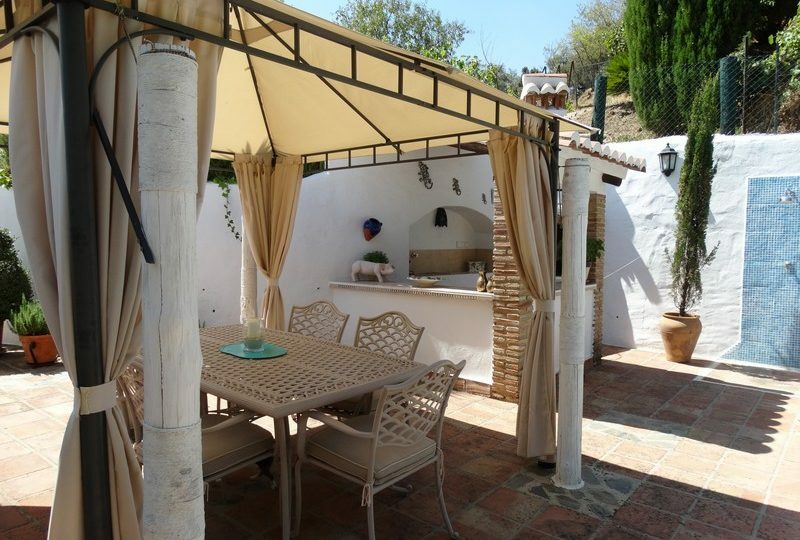 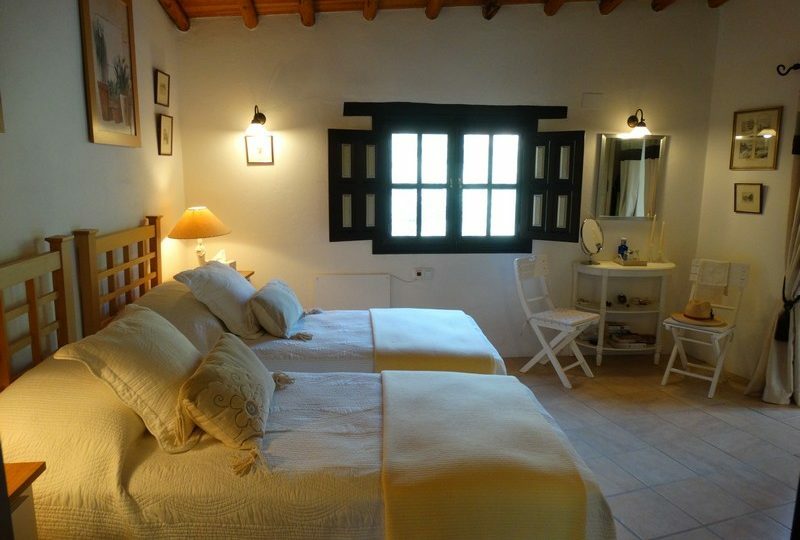 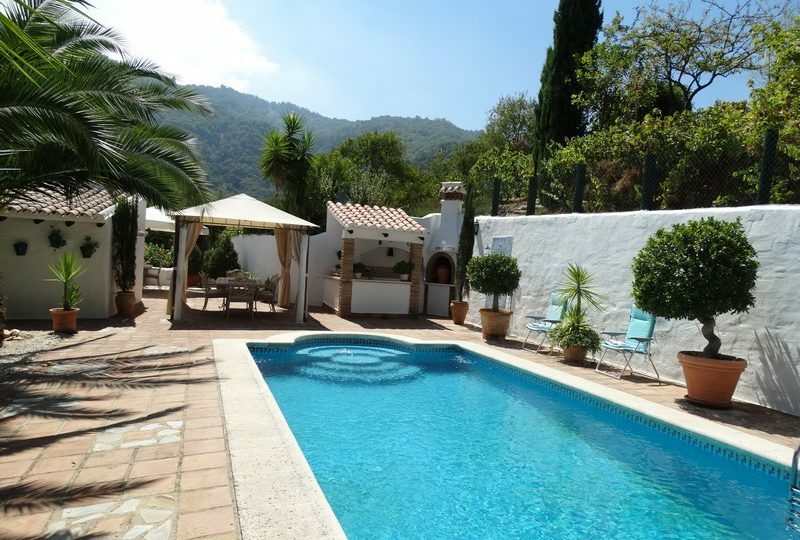 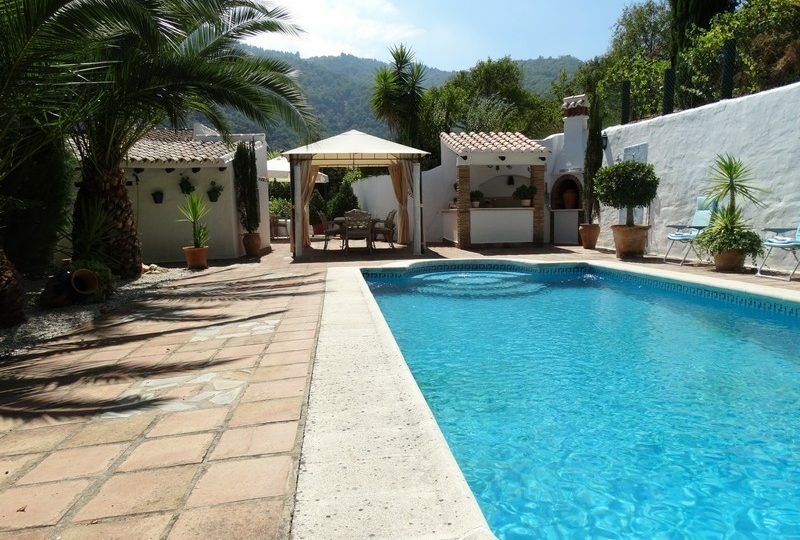 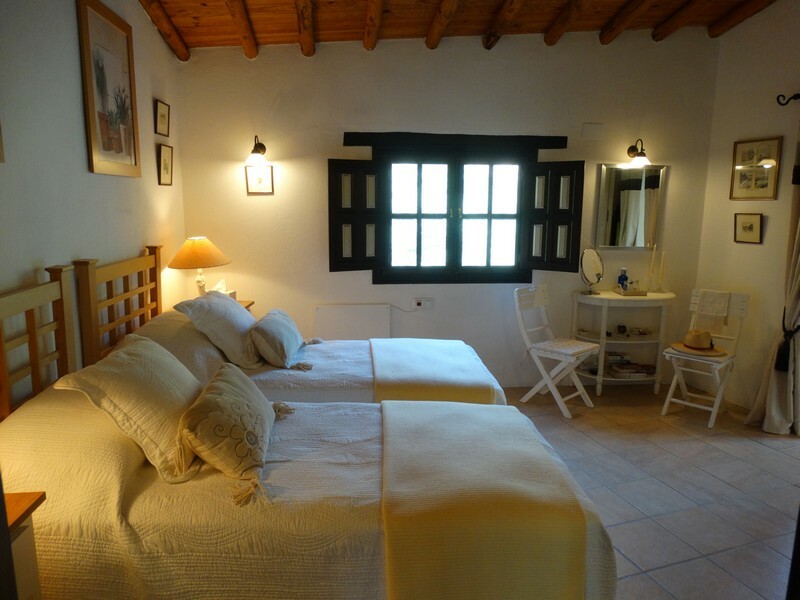 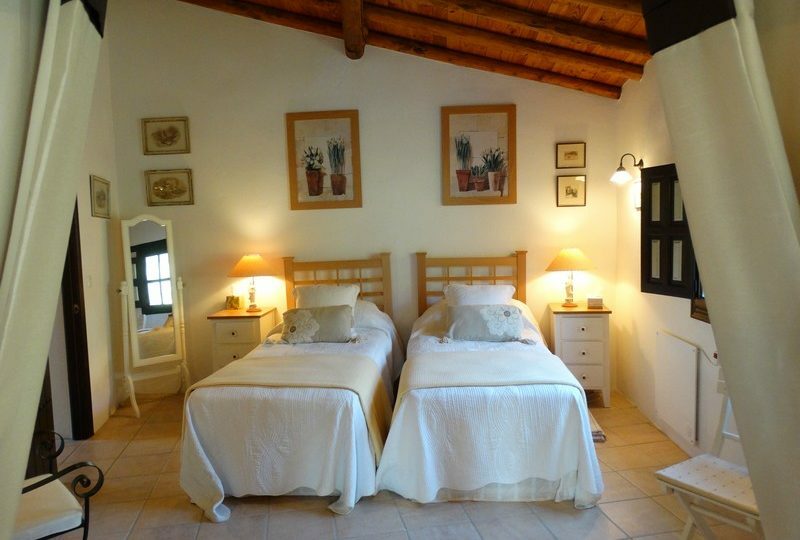 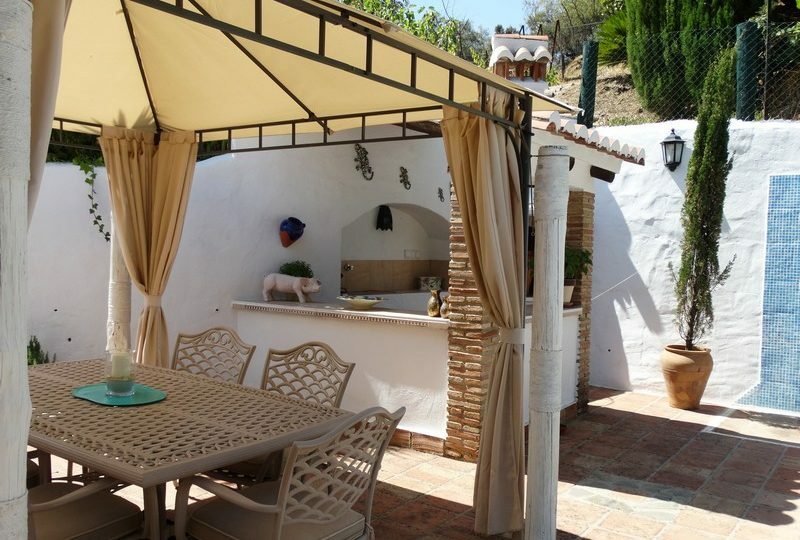 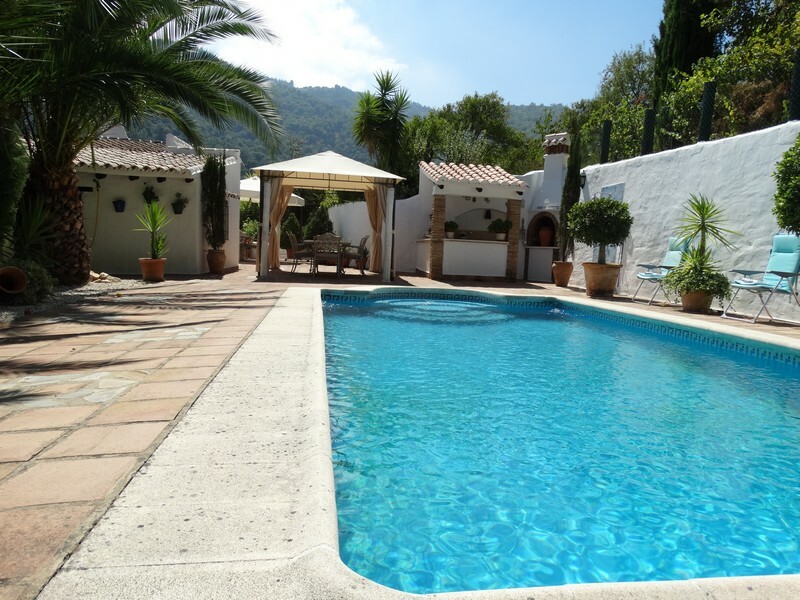 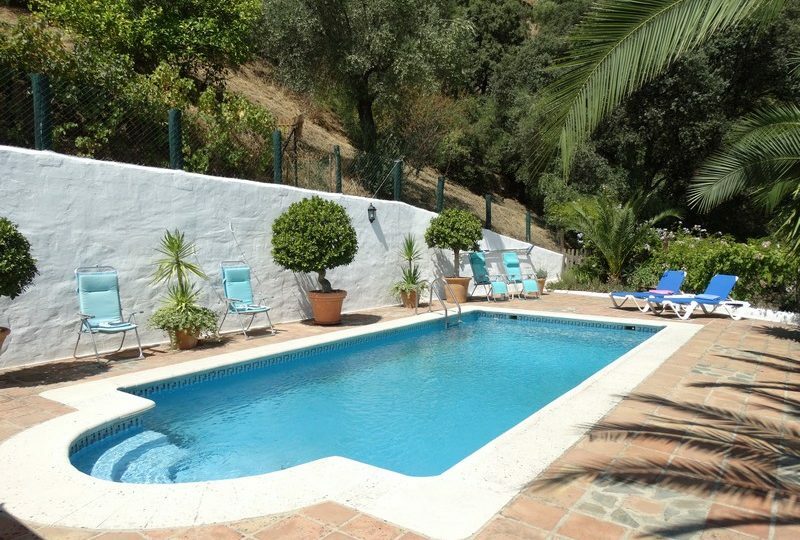 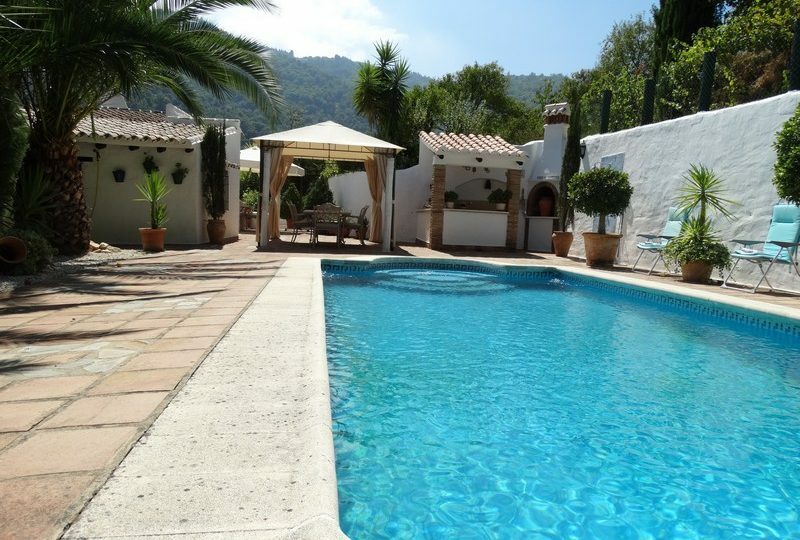 Country property for sale Andalucia: Jubrique country home with swimming pool. 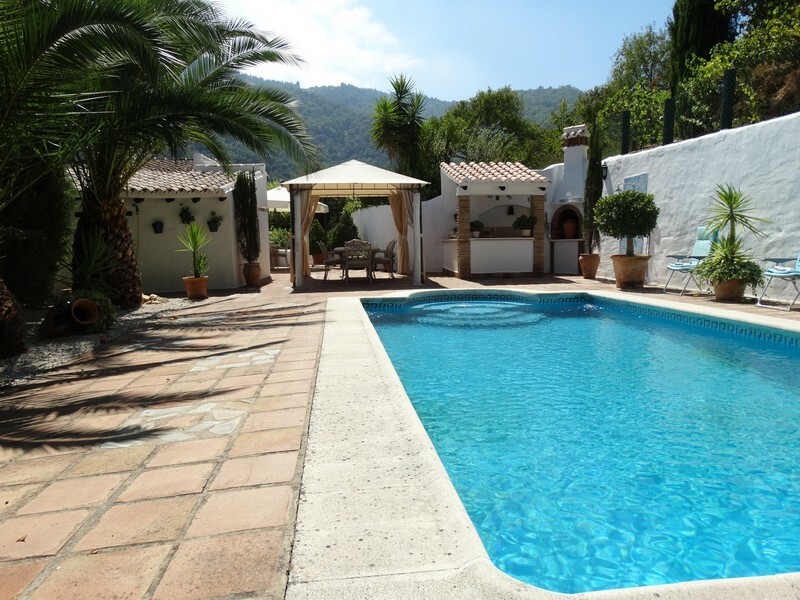 Just 5 minutes drive from Jubrique a picturesque andalucian mountain Village surrounded by forests and rivers and only 45 minutes drive To estepona. 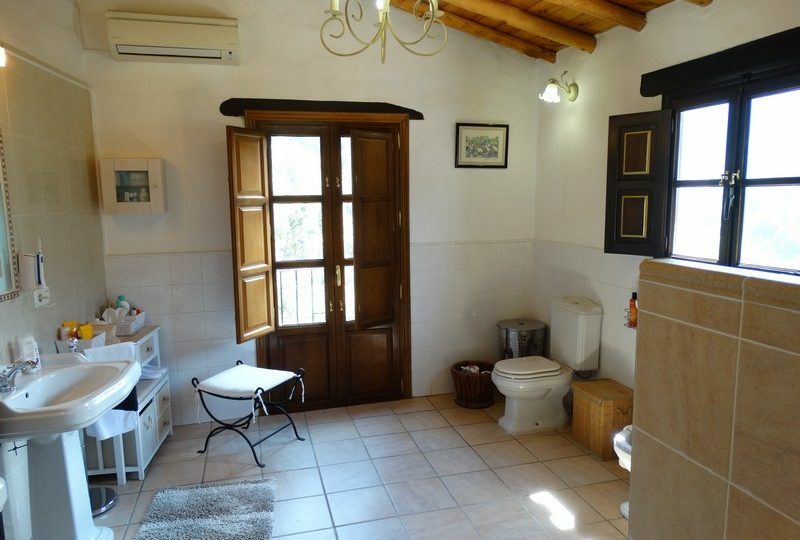 This House is a well designed property with a rustic charming design that fits the area perfectly and has very high quality finishes , built to very high standards and in inmaculate condition, its a house that would suit somebody that wants to be inmersed in the countryside and nature but have all the luxury’s of a modern villa yet with all the charm of a spanish cortijo. 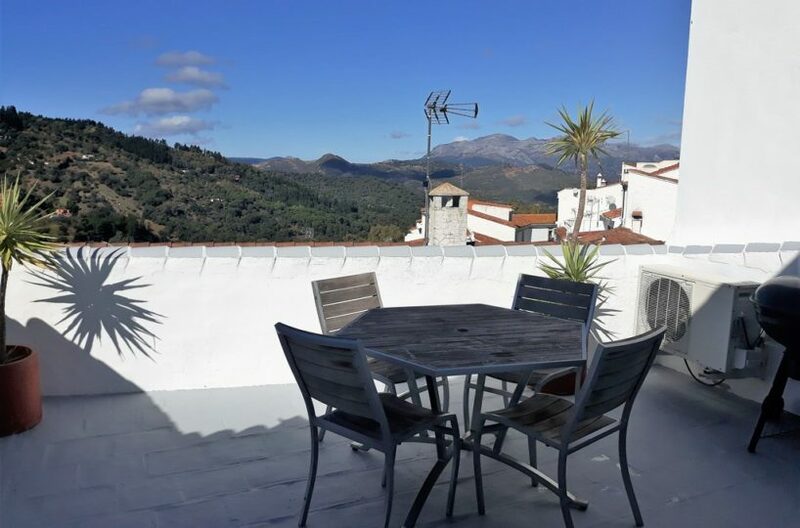 The property has an ample drive with room for at least three cars surrounded by 3 hectares of mostly steep land but with many usable terraces. 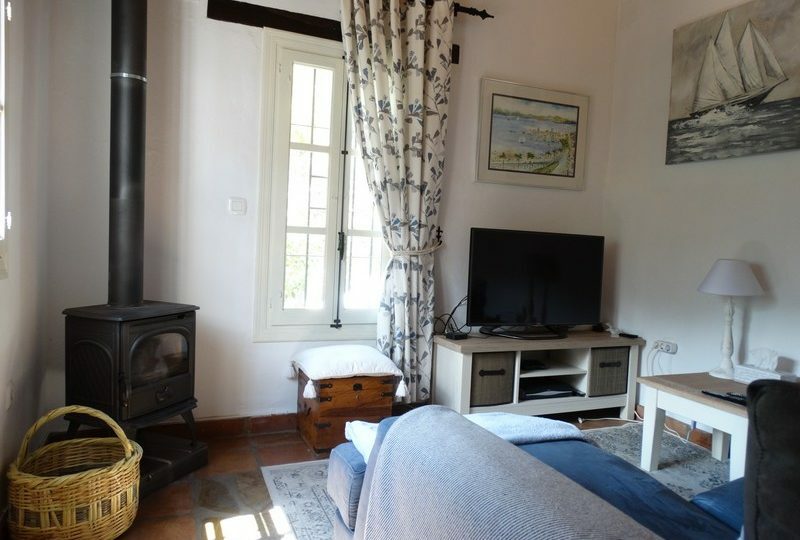 It has welcoming good sized porch as you enter and as you enter the front door you walk into a large lounge area with wood burning stove and a separate tv room/snug off that with another wood burning stove. 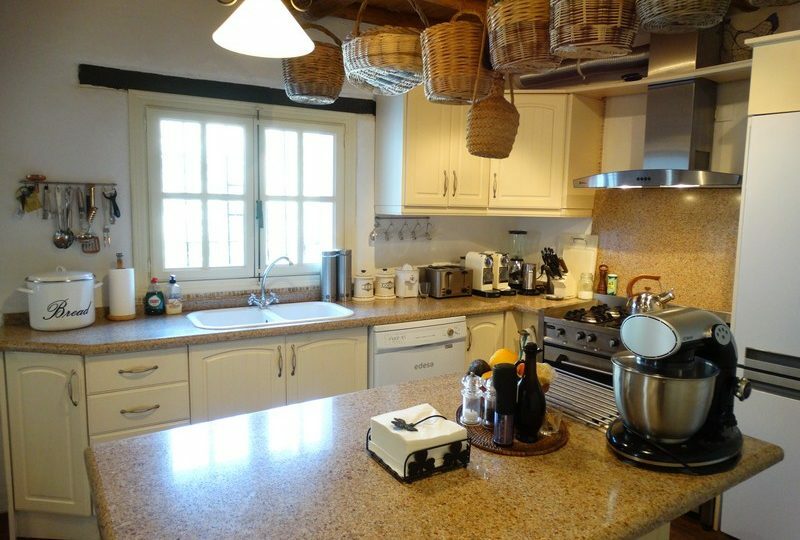 Through the lounge you access a good sized fitted kitchen of high quality with an island unit in the middle and lots of usable storage space. 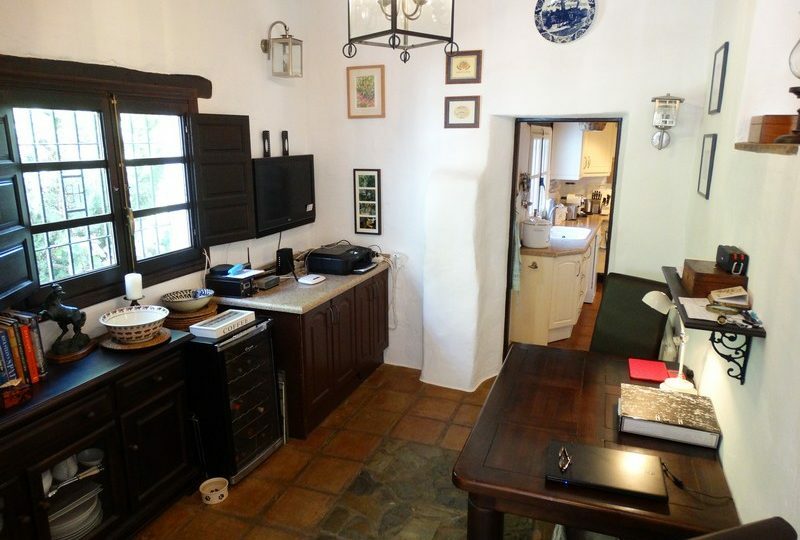 Off the kitchen you have a Large dinning room through one door and through the other an office and large guest bathroom with shower. 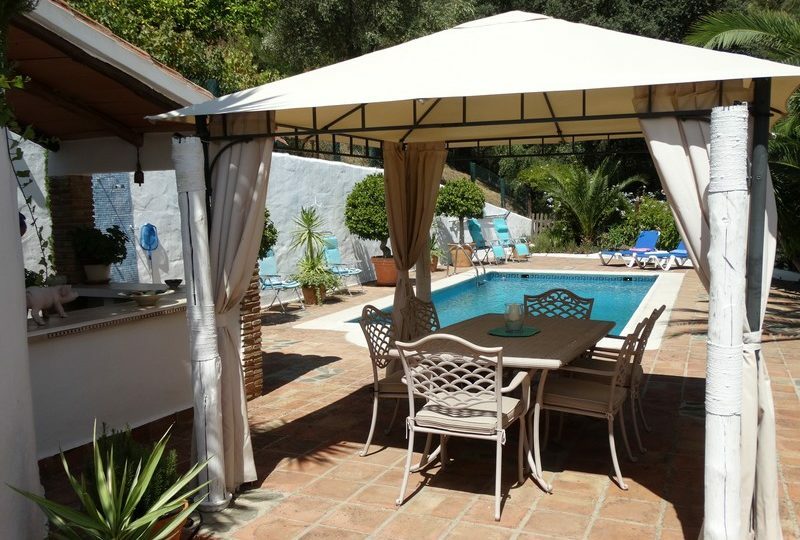 through here there is access to the swimming pool area with lots of seating areas and two pergolas so that you can have easy access to the swimming pool from the kitchen when needed. 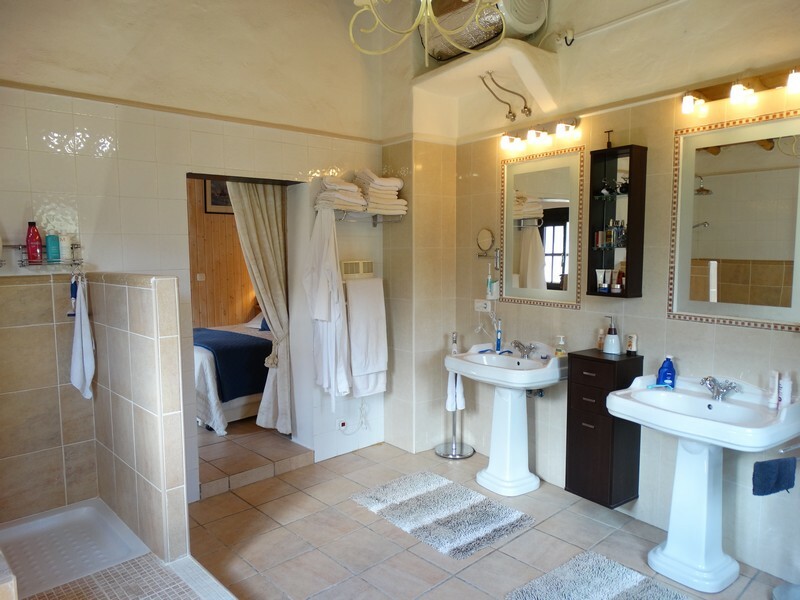 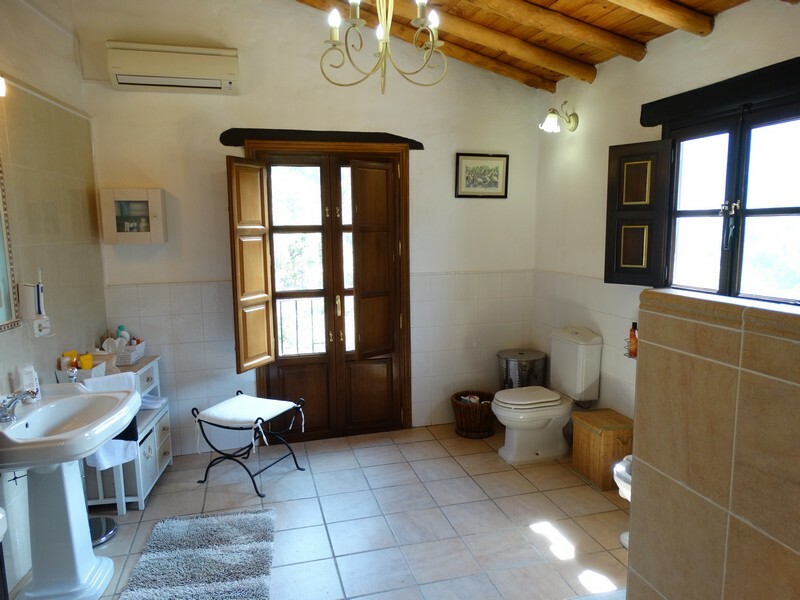 The office room with its bathroom off it could easily be another en suite bedroom if needed. 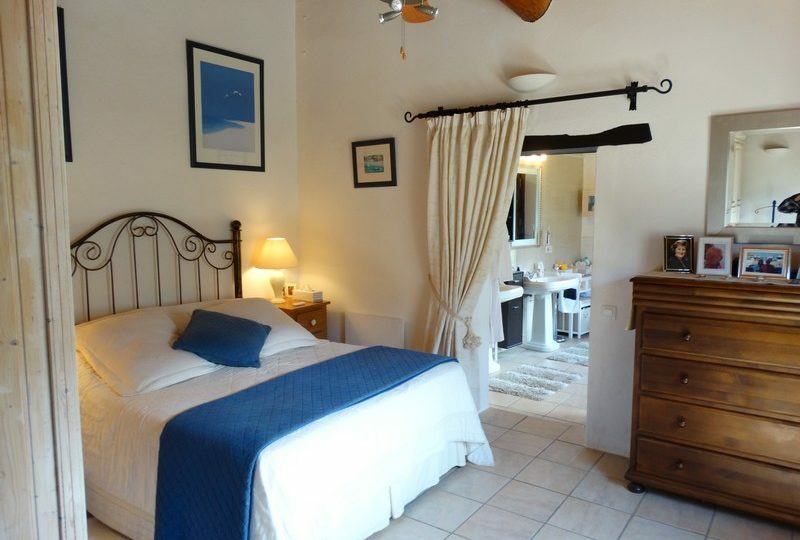 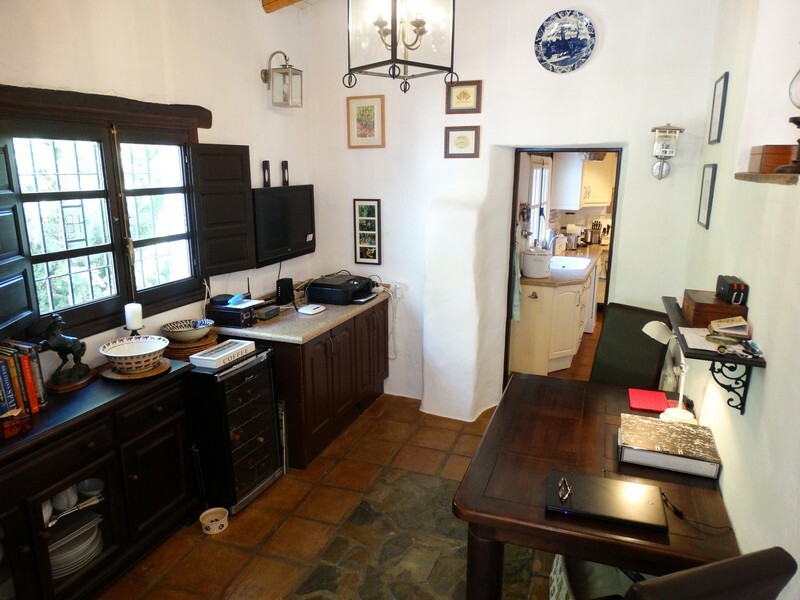 Also the property has Satelite internet and Television. 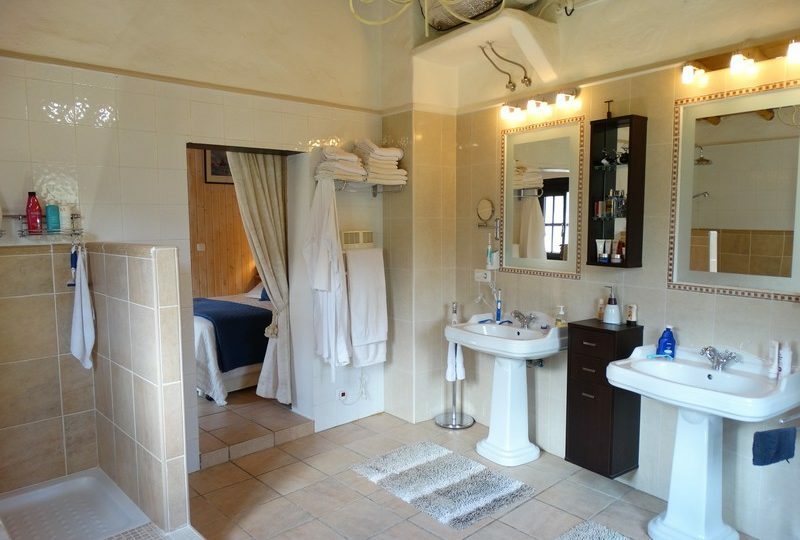 Upstairs there is a good sized hallway and two master bedrooms with lots of wardrobe space and each with its own well sized bathroom with his and her sinks and large walk in showers. 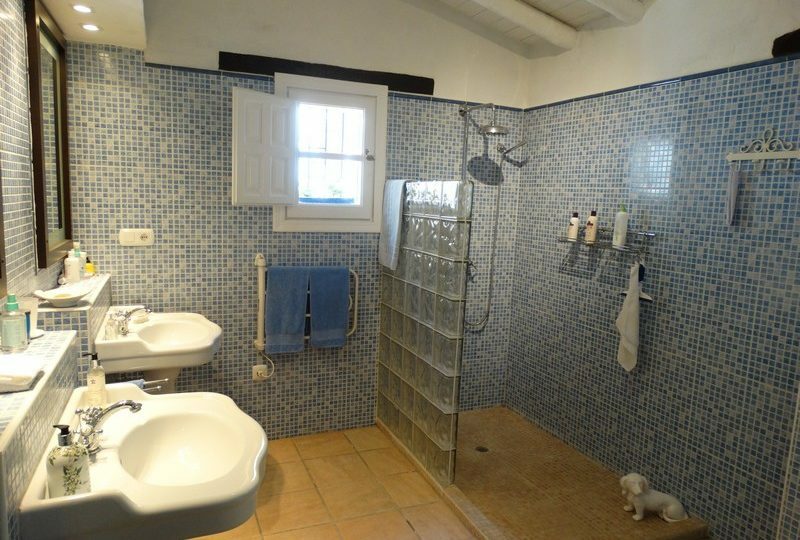 Both with Airconditioning/heating units. 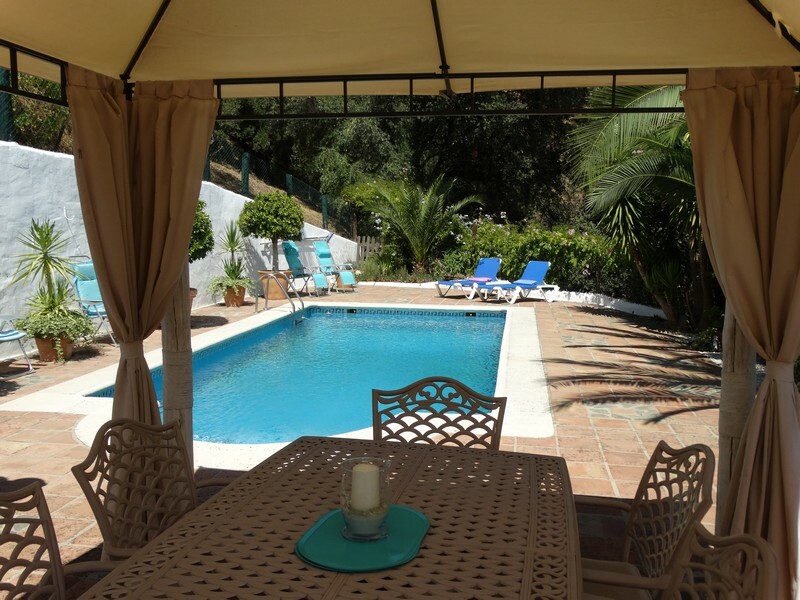 the pool area is tiled and easily maintained with lots of outdoor seating areas, An outside Bar/BBQ area and plenty of room for entertaining and enjoying the sun. 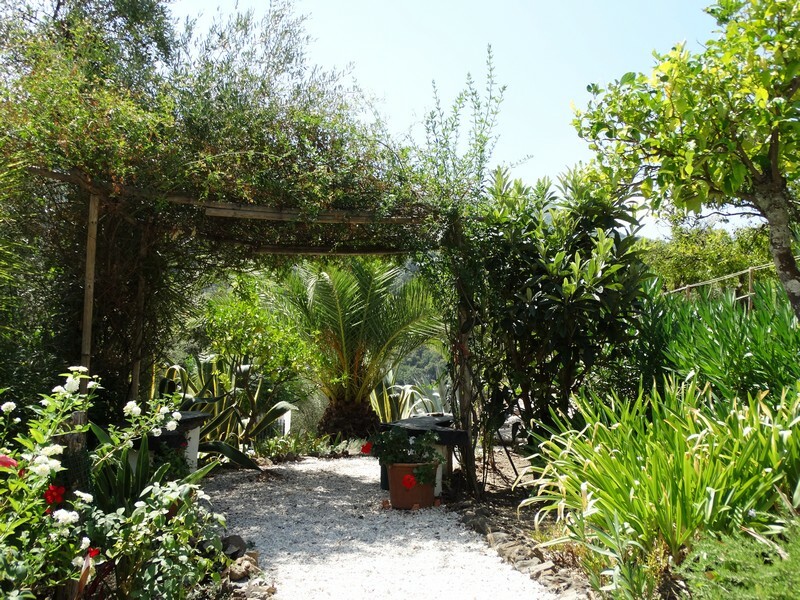 Above the house there are flat areas close by with many fruit trees and an ideal location for a vegetable garden. 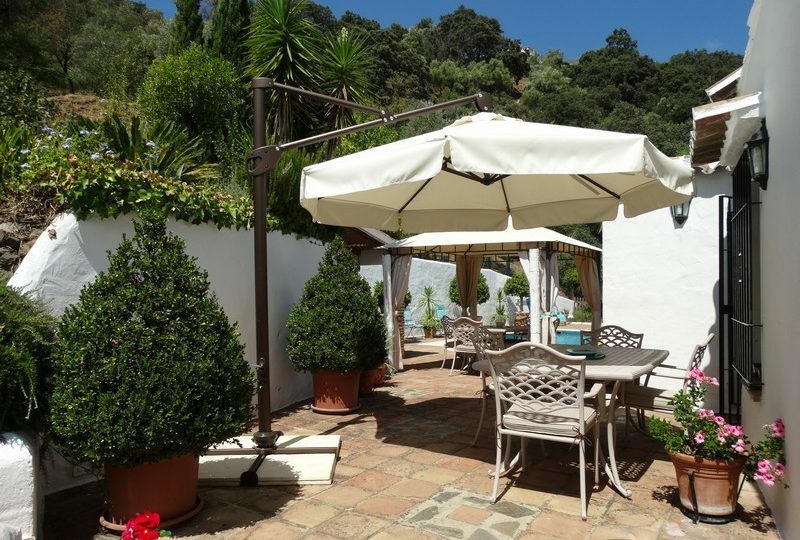 On the lower terrace below the main house is a delightful orange grove with over 100 trees of orange and lemons, very close to the river and an idilic location for a picnic. 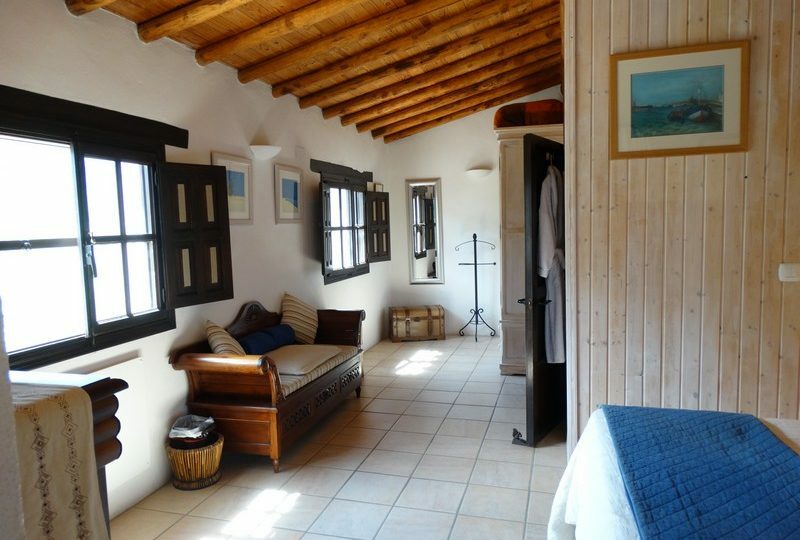 The house has Mains Electricity and good water supply from a well. 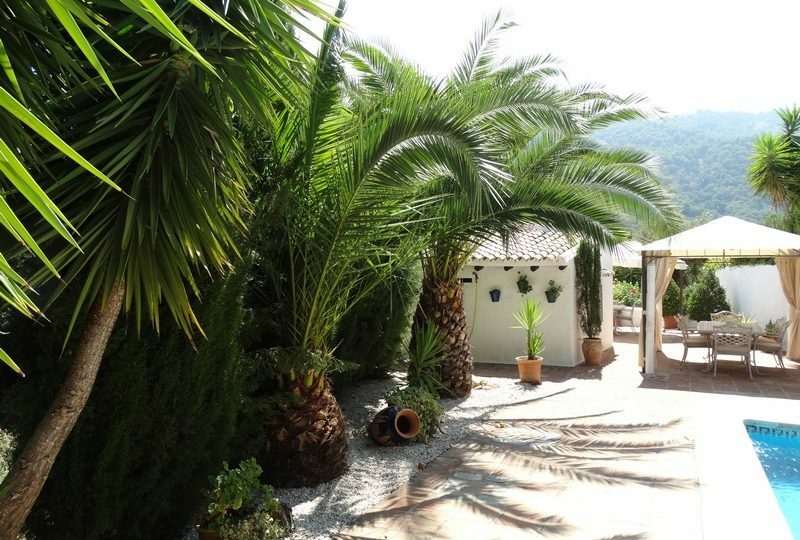 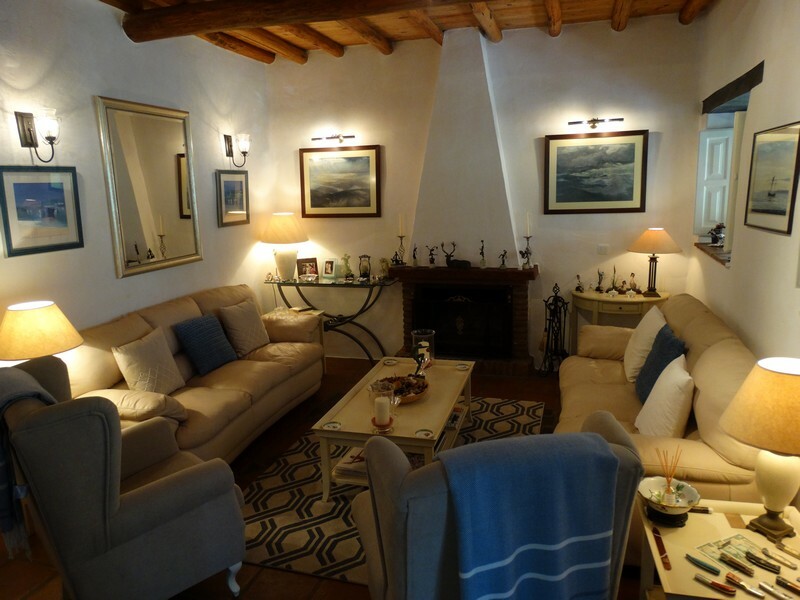 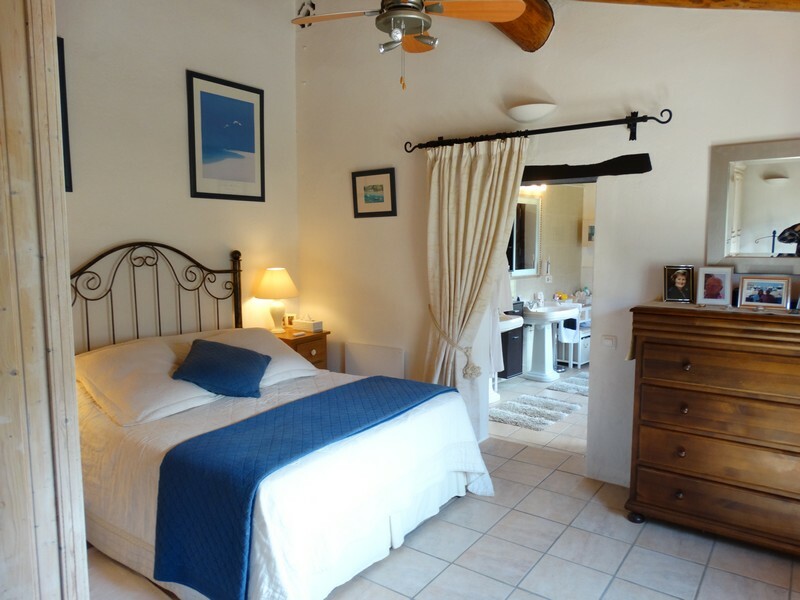 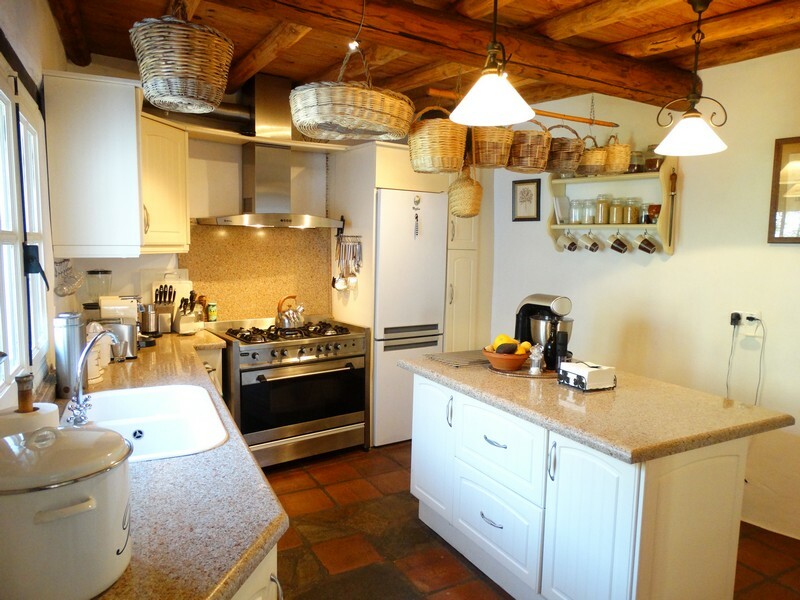 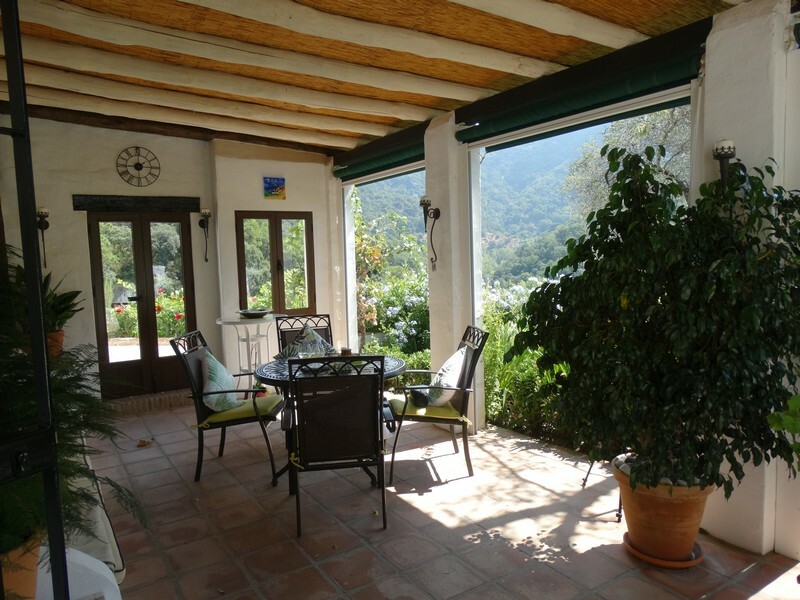 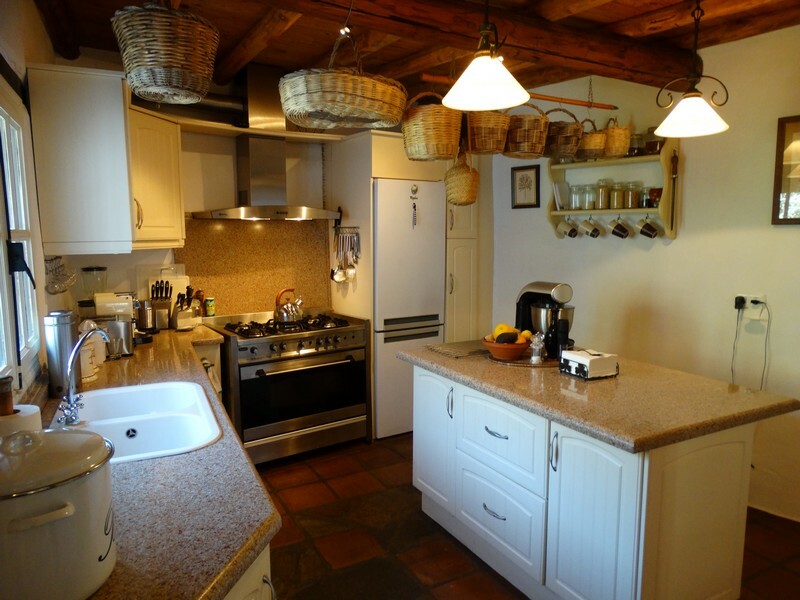 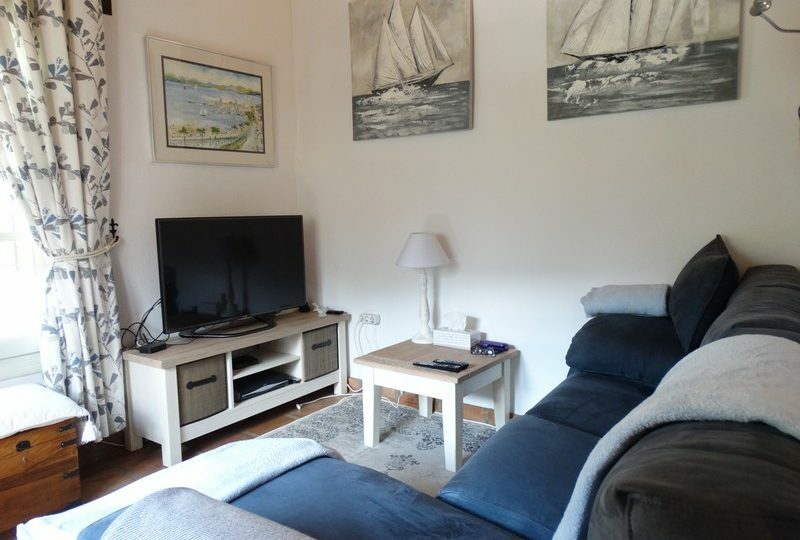 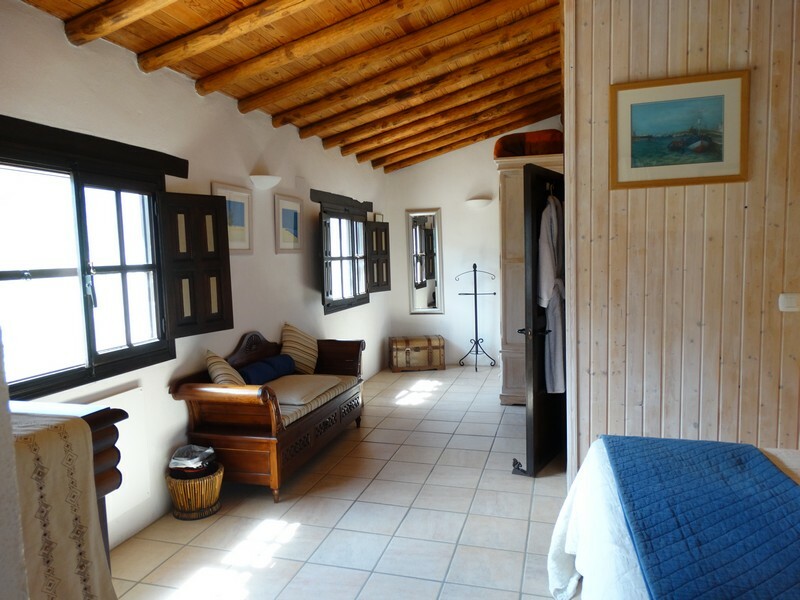 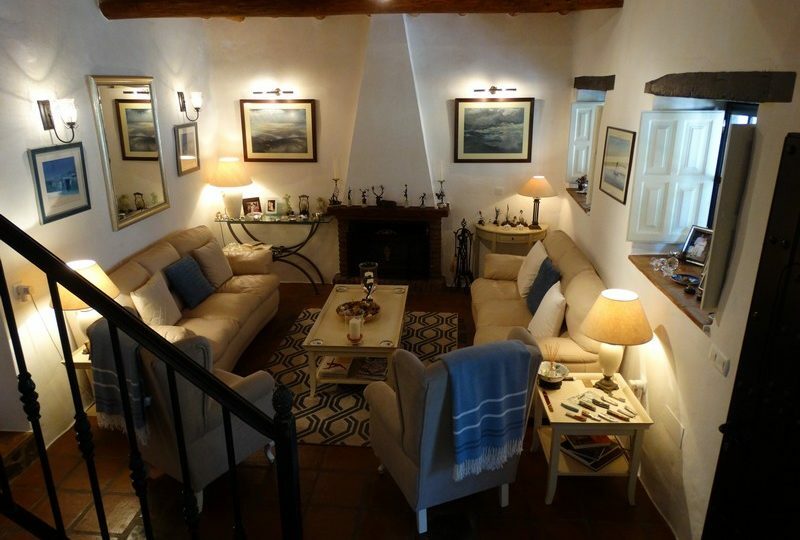 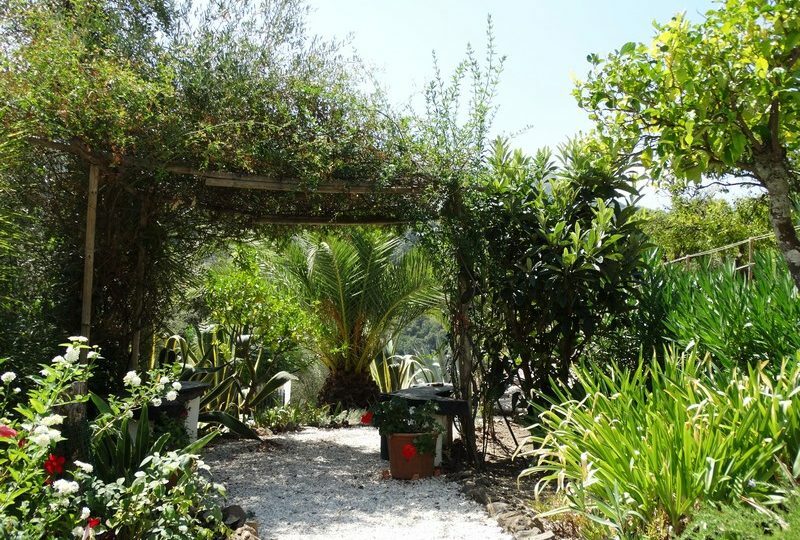 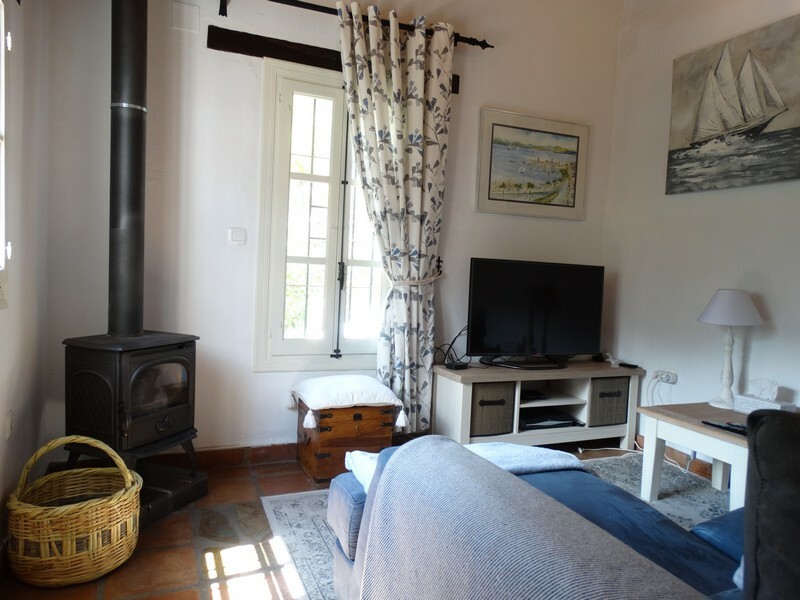 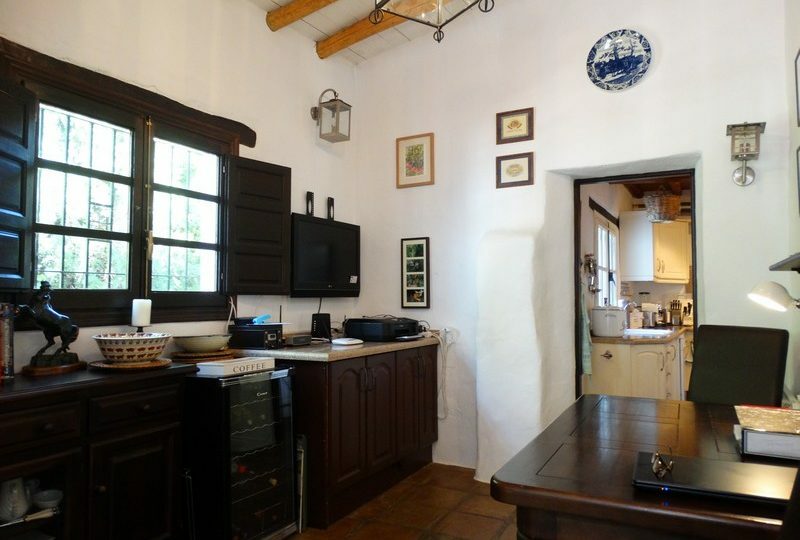 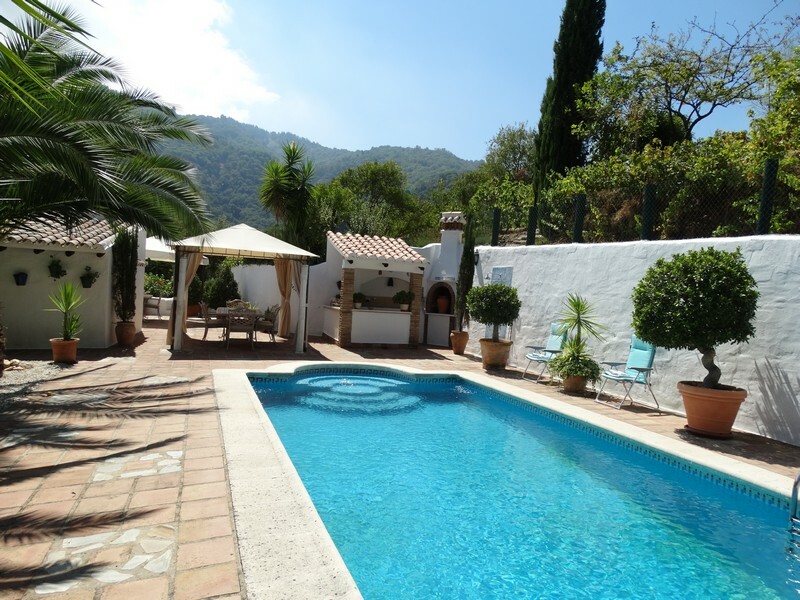 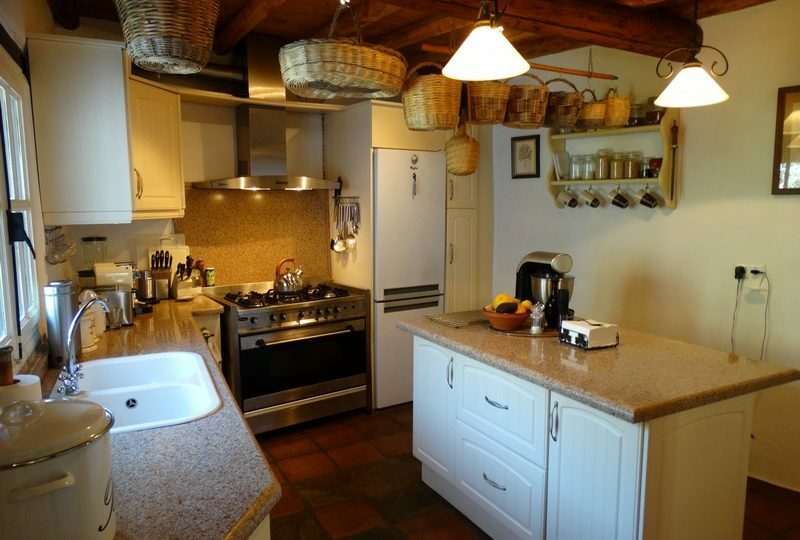 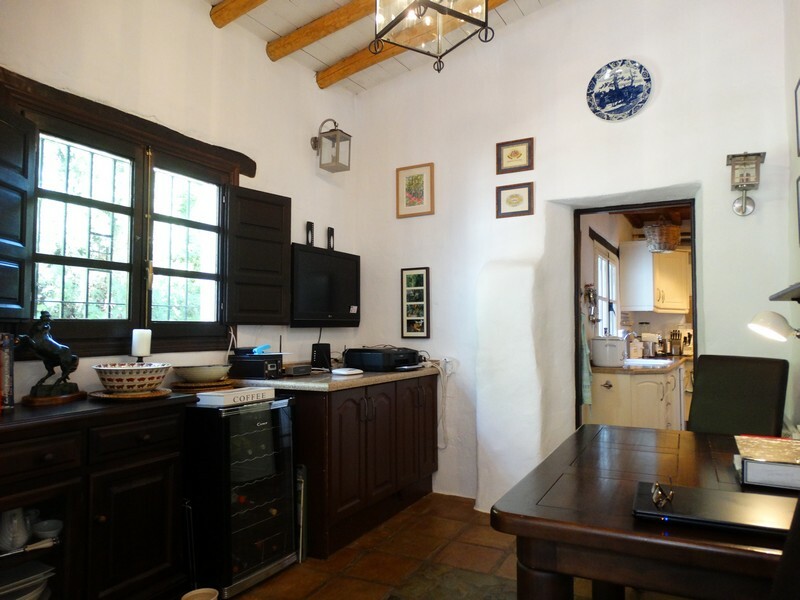 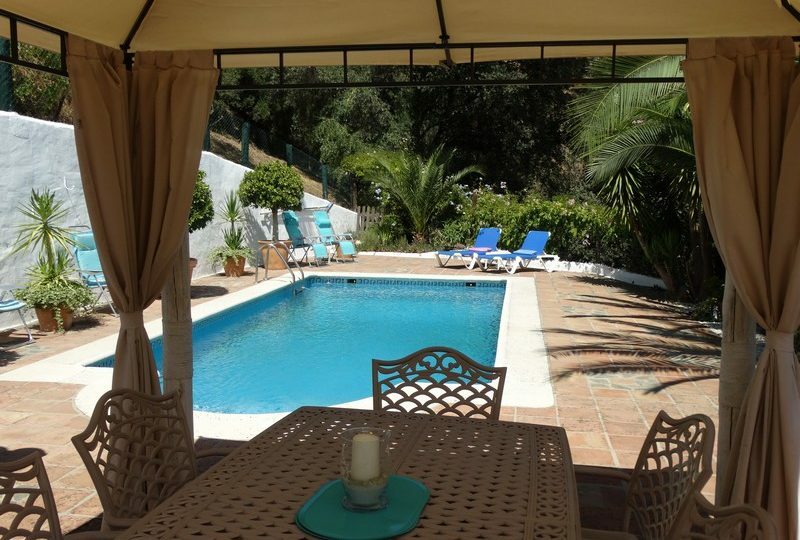 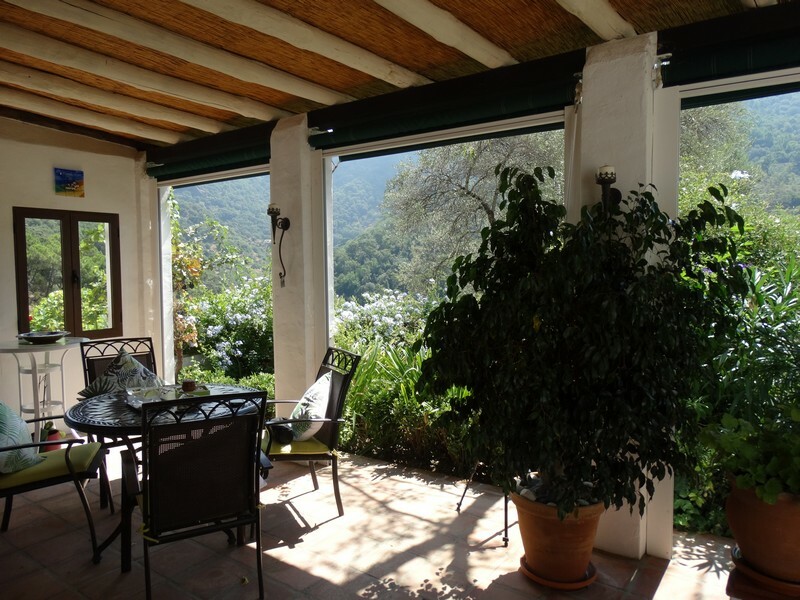 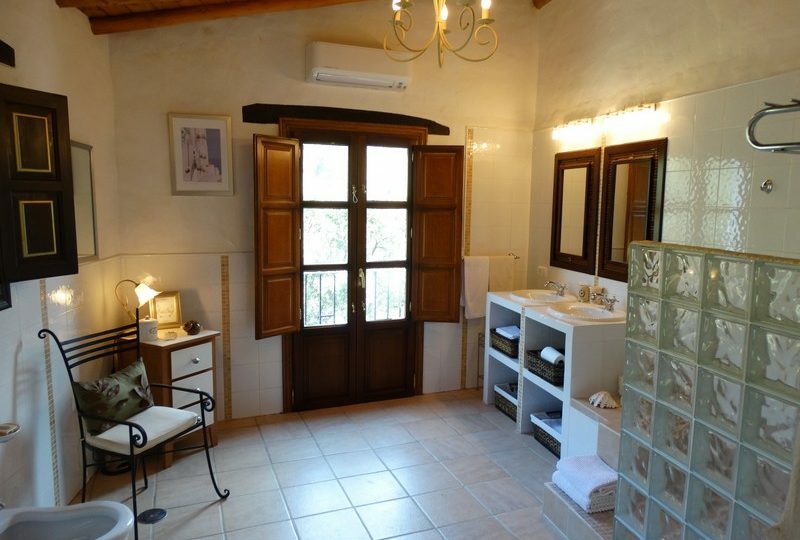 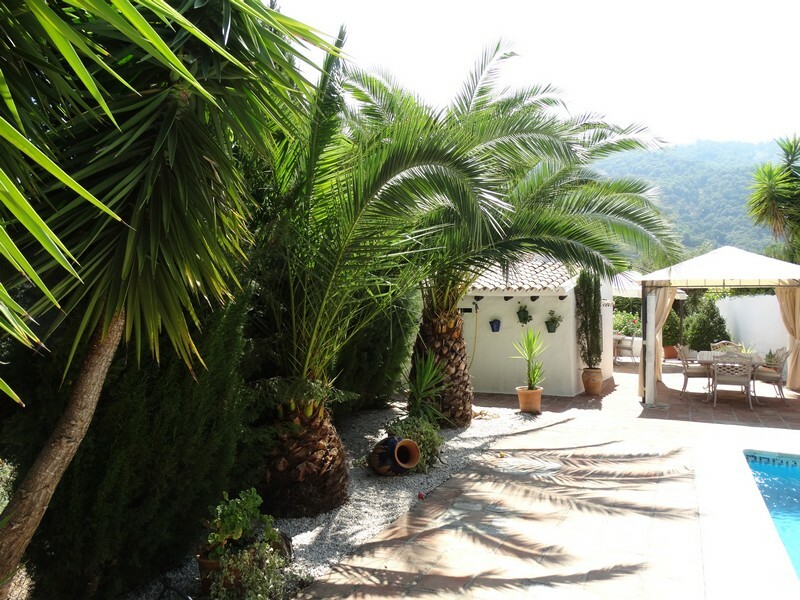 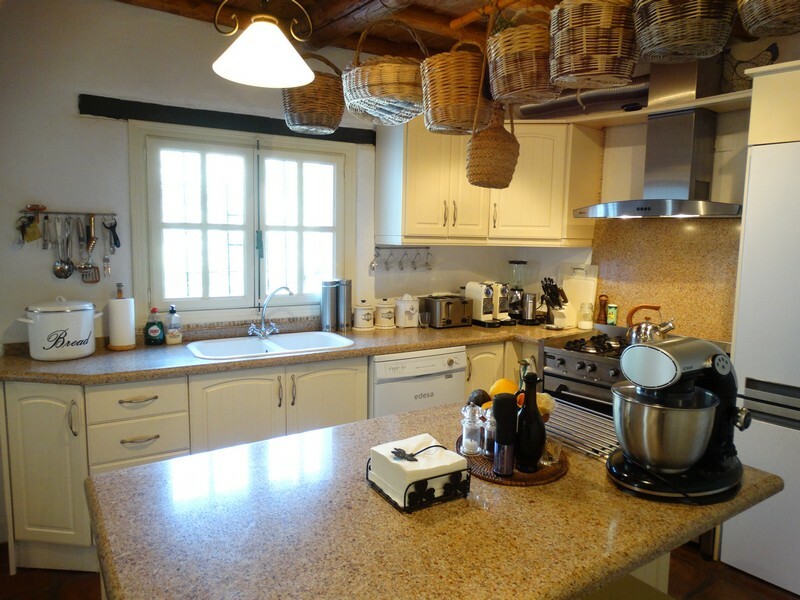 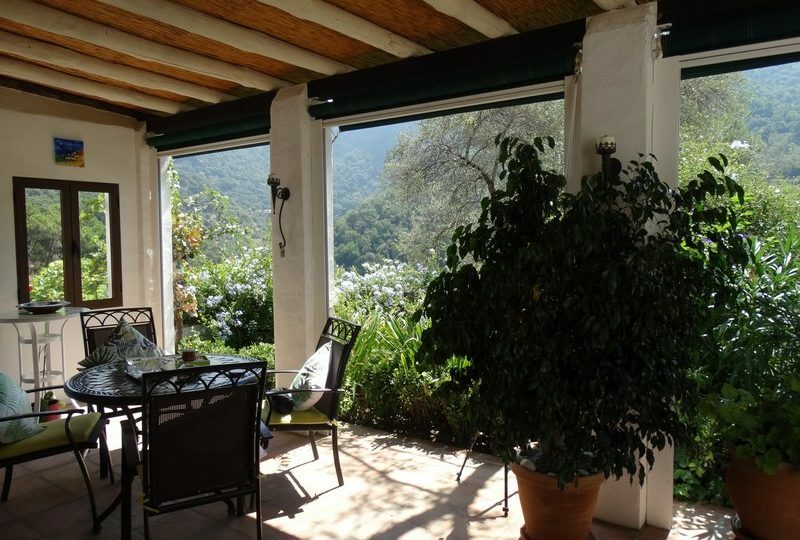 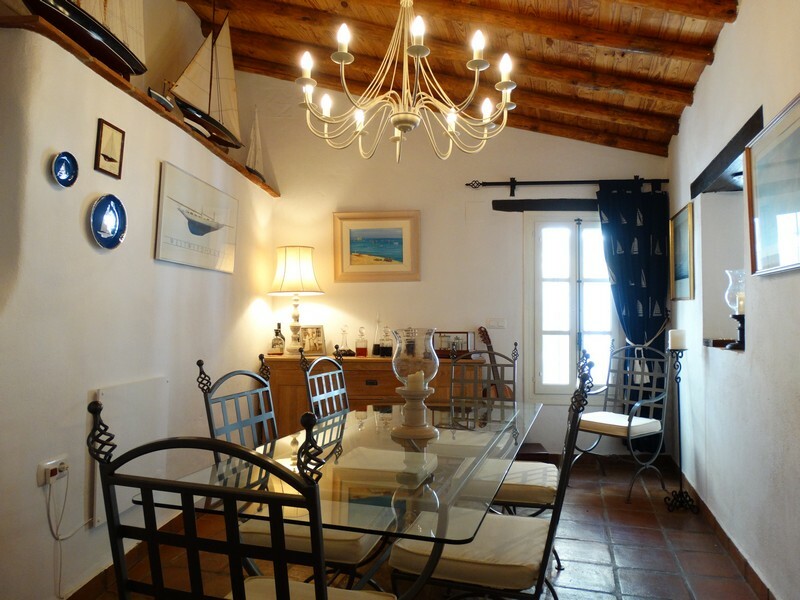 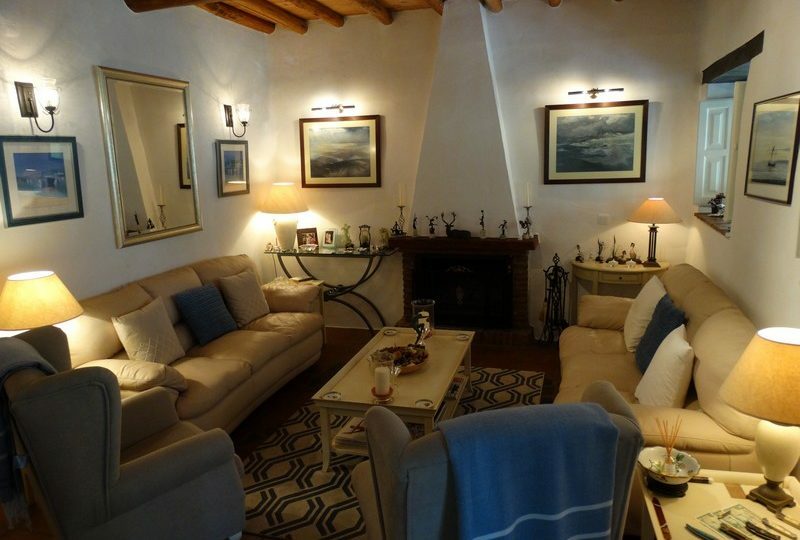 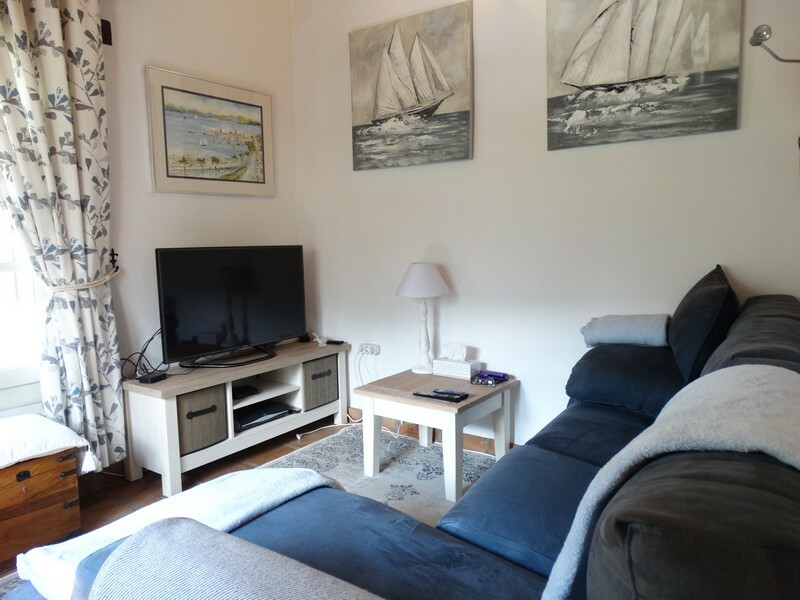 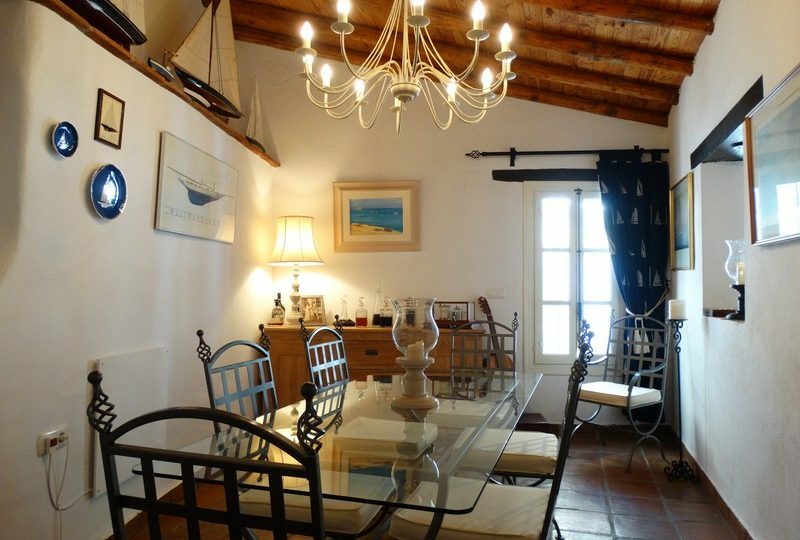 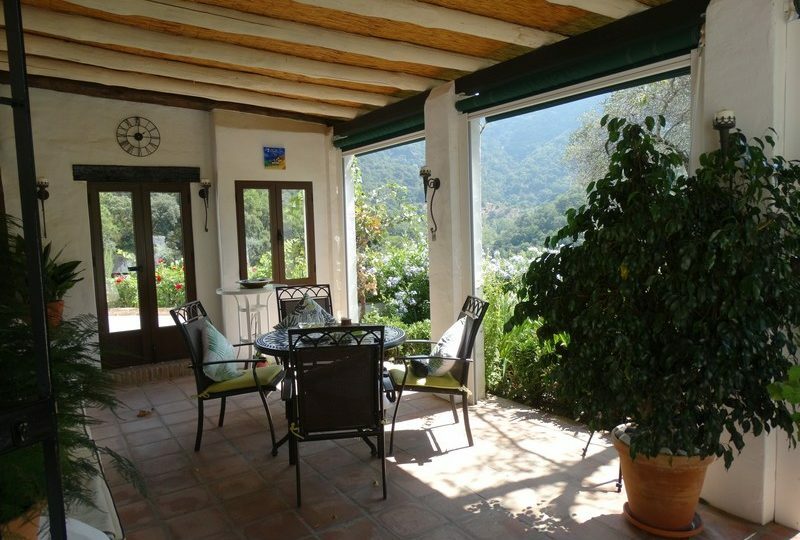 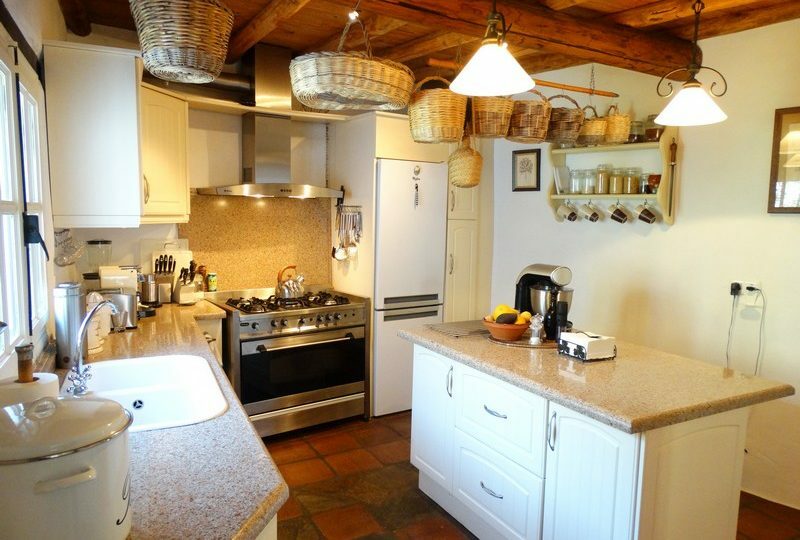 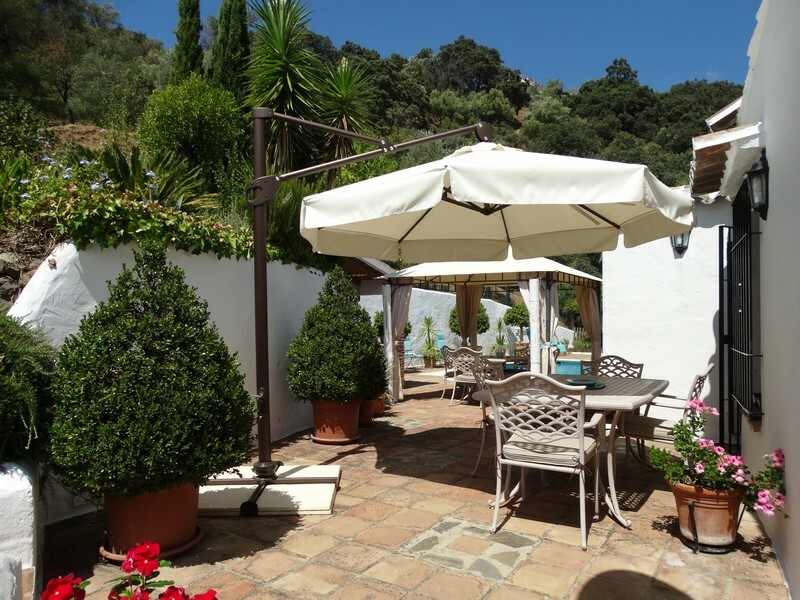 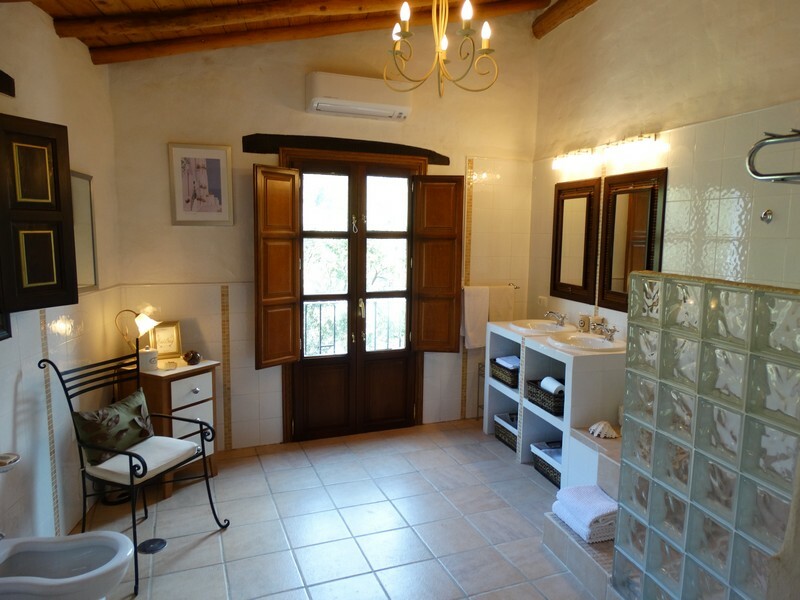 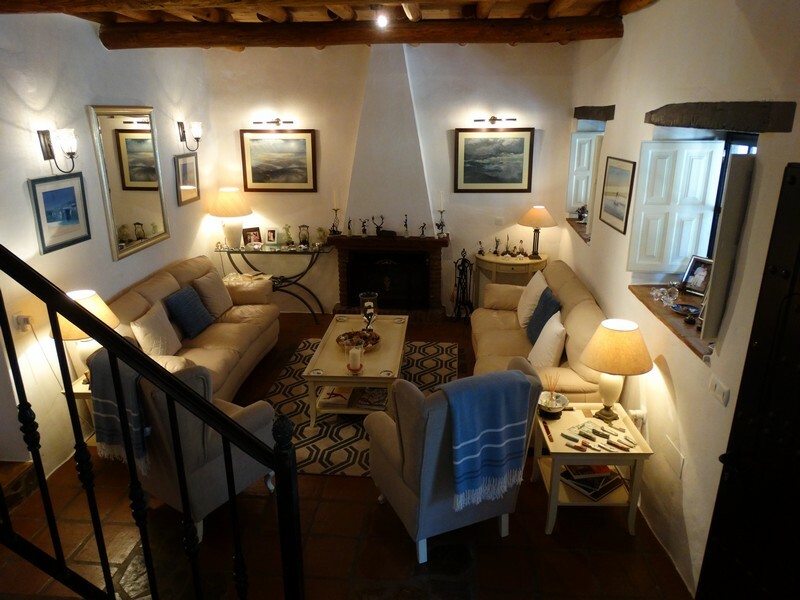 A beautifull house that is both welcoming and full of character, located in an area well known for its nature and wildlife with usable rivers very close by and easy access to the costa del sol and an about 100 minutes from Malaga airport.